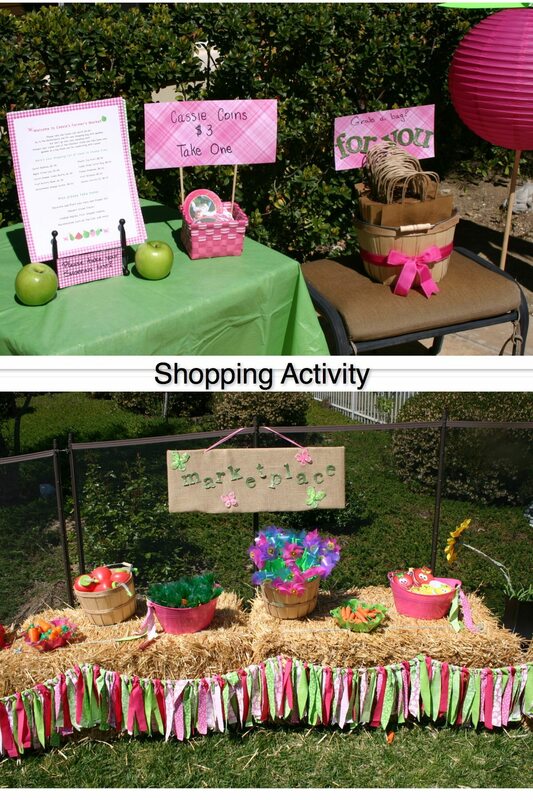 My daughter’s 3rd Birthday party theme was Cassie’s Farmer’s Market. We were in Montana for our last visit with my dad and Cassie was fascinated with the garden and picking fruit, carrots, onions, and flowers. Now that she’s old enough, it’s important to me that her parties reflect her personality, not just some theme I think is cute. My favorite element of Cassie’s party by far was the shopping activity. Mom and I were busy all week making Cassie Coins (featuring a photo of her picking carrots) and Shopping Lists, which we mounted on gingham scrapbook paper we found on clearance, and I ordered cute stuff from Oriental Trading for the kids to fill their bags with. They had $3 to spend, so it gave the parents a simple teaching opportunity if they chose to run with it. We bought cute bushels and bins and ordered fun bales of straw to set everything out on, including her favorite Minnie Mouse cash register. I knew I wanted burlap and butterflies incorporated throughout, so I got those and glitter letters for the signage. It turned out exactly how I envisioned and Cassie loved it!